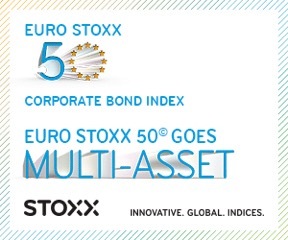 The EURO STOXX 50® Corporate Bond Index is the only one of its kind in that it tracks the performance of the Euro-denominated, investment grade corporate bonds of the EURO STOXX 50® constituents – the unmatched blue-chip equity index that is established as the gauge of the Eurozone equity market. The resulting universe, the EURO STOXX 50® Corporate Bond Index, includes the bonds of the top-flight blue-chip companies in the Eurozone, thereby representing the fixed income counterpart of the unrivalled equity index for this region. The index family includes sub-indices that represent certain maturity buckets, industry versions and rating classes. The maturity buckets include 1 – 3 years, 3 – 5 years, 5 – 7 years, and more than 7 years. There are also a EURO STOXX 50 Corporate Bond Financials, EURO STOXX 50 Corporate Bond Ex-Financials incl. maturity buckets and a higher quality AAA-A version. When used in combination with its equity counterpart, the EURO STOXX 50, the bond index can serve as a basis for a consistent analysis of the bond and equity markets. This combination ultimately provides a more accurate picture of the financial health of the blue-chip companies in the Eurozone, and as such it can serve as a sound indicator of market performance and development.